Tópico em 'Tempo Tropical' iniciado por adiabático 29 Out 2010 às 22:11. Da evolução do invest #91 surge a 21ª depressão tropical da temporada de 2010, a 19ª a ser "baptizada" com o nome Tomas. É um grande ciclone que se forma relativamente próximo das Pequenas Antilhas, que irá atingir nas próximas horas. Tenho estado a acompanhar este sistema como leigo, a "olho nú" pelo site do NHC, é impressionantea velocidade a que este sistema parece estar a evoluír e impressionante também o seu tamanho. O NHC ainda não fez saír a previsão oficial da evolução da intensidade e trajecto deste ciclone. Tempestade tropical TOMAS passa à categoria de furacão. Nos últimos dois dias o Tomas tem sido afectado por wind shear que "despiu" completamente o centro da circulação levando a um enfraquecimento drástico do sistema, que decresceu de um furacão cat.2 para uma tempestade tropical de 40 nós... No entanto, nota-se nas últimas horas um reaparecimento de convecção próximo do centro que pode significar que a fase de refortalecimento, que sempre esteve nas previsões, pode estar a começar efectivamente mais cedo do que o NHC prevê no seu último boletim, que ainda admitia um período de enfraquecimento e só a partir de 24 horas uma recuperação, possibilitada pela diminuição do shear e pelas condições atmosféricas e da água do mar que, de resto, são favoráveis. O NHC refere que a reintensificação é sustentada em todos os modelos. UNITED NATIONS - THE United Nations ordered emergency food and shelter on Monday to parts of Haiti threatened by Tropical Storm Tomas as aid agencies struggled with earthquake recovery and a cholera epidemic. Up to 500,000 people could be affected by Tomas, which is expected to strike the already battered nation as a hurricane late on Friday, UN agencies said. The agencies have rushed supplies to camps across Haiti, in some cases sending enough fuel for seven days in anticipation that roads will be cut by the hurricane, the UN Office for the Coordination of Humanitarian Affairs (OCHA) said in a statement. Aid agencies are 'stretched to the limit,' said UN Humanitarian Coordinator in Haiti Nigel Fisher. The United Nations said it needs 150,000 tarpaulins, 90,000 cases of soap, 90,000 hygiene kits, 200,000 sachets of oral rehydration salts to treat cholera and 200 tents for emergency cholera treatment centers. Stocks in Haiti have already been depleted by a storm that hit on Sept 24. CONVENTIONAL SATELLITE AND MICROWAVE DATA. SCHEDULED TO INVESTIGATE TOMAS THIS AFTERNOON. CHANCE OF A 30-KT INCREASE IN WIND SPEED DURING THE NEXT 24 HOURS. Tomas degradou-se mais um pouco, dados recolhidos por um avião mostram uma circulação deficiente e alongada, sem ventos de intensidade de tempestade tropical, pelo que agora é considerado apenas depressão tropical. Com uma circulação muito alargada e centro difícil de localizar com exactidão, além do movimento errático, a previsão exacta do trajecto para norte e nordeste nos próximos dias é bastante incerta, mas muitos modelos continuam a prever uma reintensificação que poderá trazer problemas ao Haiti, o grande motivo de preocupação com este ciclone, e também à Rep.Dominicana. Mesmo que não se intensifique muito em termos de vento, a chuva será sempre um problema. O TOMAS intensificou-se e voltou a ser um furacão de categoria 1. Isto à medida que se aproxima lentamente do Haiti. Storm Warning area and in the Hurricane Warning area in Haiti. (CNN) -- Rain associated with Tropical Storm Tomas began falling on Haiti on Thursday afternoon as aid agencies scrambled to move as many people as possible into storm shelters. The storm -- even if it does not regain hurricane strength -- could deal a disastrous blow to a nation still struggling to its feet after a devastating January earthquake. It showed signs Thursday night of becoming better organized, the National Hurricane Center in Miami, Florida, said. "People are already dislocated," said Leonard Doyle, spokesman for the International Organization for Migration, which is moving about 2,000 people from the Corail Cesselesse tent camp into a nearby shelter: a former church. The group is working "as fast as we can," he said Thursday morning. "We don't have anywhere to move any of the people in the camps that we manage directly other than Corail," Deb Ingersoll of the American Refugee Committee said of the Corail Cesselesse camp. The committee serves about 100,000 people in three other camps, she said. Although her organization is helping disseminate information and encourage people to leave, "to be honest, I'm not sure many of them will," she said. "They're very entrenched here," and many worry about losing their possessions. "They're looking at us like we're crazy for telling them they should leave," Ingersoll said. "They don't seem to think this is an event. ... Aid workers are far more worried than they are." She said group members are dismantling tents in the center of camp to prevent them from becoming projectiles in the wind and encouraging residents to find family or friends who still have homes to stay with. Videos of relocations on the International Organization for Migration's website show pickups piled precariously with mattresses and people. The forecast provided a bit of good news Thursday, saying Tomas is no longer expected to re-intensify into a hurricane before it passes by Haiti and Cuba through the 50-mile-wide Windward Passage. Although Tomas is expected to become a hurricane again, that is not forecast until it is a bit north of Cuba and Haiti. In addition, the track has shifted westward, meaning a landfall is now anticipated on the eastern tip of Cuba. There is still a risk of a Haiti landfall, however, as the nation is within the cone of uncertainty. However, despite its classification, Tomas is forecast to dump 5 to 10 inches of rain on Haiti, with isolated maximum amounts of 15 inches in some areas -- amounts that could trigger flooding and landslides. In addition, a storm surge could raise water levels by as much as 1 to 3 feet above normal tide levels in the warning area in areas of onshore winds, accompanied by "large and destructive waves," said the National Hurricane Center. As of 8 p.m. Thursday, Tomas' winds were at 60 mph (95 kph). "The next 36 hours are the primary threat to the area," said National Hurricane Center Director Bill Read. The main threat is the heavy rain, he said, which will be strongest Thursday night and Friday morning. "Any amount of rain is dangerous here," Ingersoll said, noting that many residents are housed in tents that have experienced sun, rain and wind for 11 months and are "not very well secured." Rain bands associated with Tomas were moving across Haiti and Jamaica on Thursday afternoon, the Hurricane Center said. The government has been advising Haitians to seek sturdy shelter since Wednesday, Doyle said. Humanitarian organizations are doing what they can. But with an estimated 1.3 million Haitians left homeless by the January 12 earthquake, the task before them is enormous. "For most [internally displaced persons] and those living in communities vulnerable to flooding, there are few good options," the International Organization for Migration says on its website. Winds associated with Tomas, if it re-intensifies into a hurricane, could reach 100 mph, and "these could be accompanied by bands of torrential rain certain to shred the already-fragile IDP shelters. There are many camps at risk from landslides and flash flooding if the storm strikes." In a video posted on the organization's website, staffer Renald Dezarin said he stayed in one of the tents previously, and it was a "frightening situation" when the wind blew or rain fell. Even before the 7.0-magnitude earthquake, Haiti was the poorest country in the Americas, with about 80 percent of its residents living in poverty, according to the CIA World Factbook. As it grappled with rebuilding, a cholera outbreak occurred, with a current death toll of nearly 450 people. 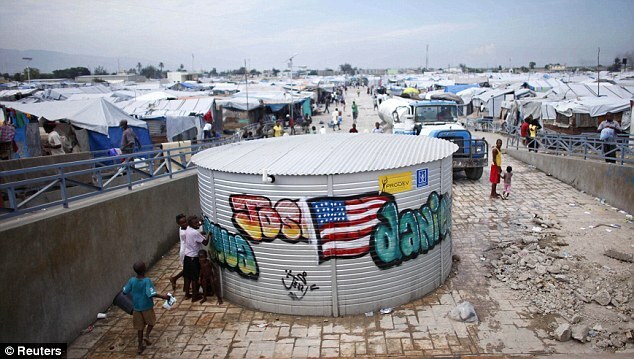 "Even if Tomas only brushes Haiti, it may exacerbate the epidemic, facilitating the spread of the disease into and throughout metropolitan Port-au-Prince, where a third of the population remains homeless and in camps," the International Organization for Migration said. But many structures that would usually be used for storm shelters -- schools and hospitals -- are no longer standing. And many of Haiti's homeless have no options. "Clearly, there's not enough [structures]," Ingersoll said. "If I had friends or family with homes, I would have been there on the 13th of January," the day after the earthquake, Franklin Mezulus, 53, told Time magazine. Mezulus lives in a camp on a hillside outside of Port-au-Prince with eight children under his care, according to Time. "If a storm hits, I'll have nowhere to go." A hurricane warning was issued for Haiti late Wednesday. Another hurricane warning was issued early Thursday for the southeastern Bahamas and the Turks and Caicos. The government of Cuba issued a warning for the province of Guantanamo on Thursday as well. The warning means hurricane conditions are expected in 24 to 36 hours, according to the Hurricane Center. As of 8 p.m. Thursday, the center of Tomas was about 90 miles (150 kilometers) southeast of Kingston, Jamaica, and about 265 miles (425 kilometers) west-southwest of Port-au-Prince, Haiti. It was moving north-northeast at 8 mph (13 kph). Tomas was once was a Category 2 hurricane and then weakened to a tropical depression before re-intensifying. Forecast maps show Tomas crossing the eastern tip of Cuba early Friday as a tropical storm. "On the forecast track, the center will pass near Jamaica or Haiti tonight, near or over extreme eastern Cuba Friday and near or over the southeastern Bahamas late Friday and Friday night," the Hurricane Center said. It was expected to turn northeast and accelerate over the next two days. Tropical storm conditions were expected to reach the coast within the warning area later Thursday. Tropical storm-force winds extend outward up to 120 miles (195 kilometers) from Tomas' center. In August, the Clinton Foundation committed $1 million to build 14 emergency shelters in Haiti, and six are complete, each able to house 80 people, Time said. The Red Cross has positioned supplies in Port-au-Prince and southwestern coastal cities ahead of Tomas, the magazine said. The U.S. Southern Command said Wednesday that the USS Iwo Jima has been deployed to Haiti to provide humanitarian support. But "we're basically maxed out," Oxfam spokeswoman Julie Schindall told Time. "We're mounting two emergency responses, and we can't handle a third." Haiti's president and prime minister held an emergency Cabinet meeting to discuss evacuations of coastal communities, the United Nations said Wednesday. Doyle pointed out that Haitians are "incredibly resourceful," even if they don't have much to work with. A strong people with robust family ties, Haitians have experienced hurricanes before, he said. Elsewhere, a tropical storm warning was issued for Jamaica, and the southern coast of the Dominican Republic -- from the Haitian border eastward to Barahona -- was under a tropical storm watch, as were the Cuban provinces of Santiago de Cuba and Holguin as Tomas neared. The storm is expected to pass just to the east of Jamaica, but is predicted to produce only 1 to 3 inches of rain there. Three to 5 inches is predicted over the southeastern Bahamas and the Turks and Caicos, the Hurricane Center said. Tomas hit the West Indies island of St. Lucia as a Category 1 hurricane on Sunday morning and caused major damage by the time its winds subsided Monday night. At least 12 people died in the storm, according to St. Lucian Prime Minister Stephenson King. Rebuilding has begun on the island, including the rehabilitation of two bridges that collapsed in the storm, St. Lucia's government said in a posting on its website this week. King has asked France to assist the island "in the aftermath of what is already being described as the worst-ever natural disaster in St. Lucian history," the government said. The Caribbean Catastrophe Risk Insurance Facility has said it will make payments to St. Lucia, Barbados, and St. Vincent and the Grenadines for damage sustained in Tomas. Preliminary calculations show a payout of $3.2 million for St. Lucia, but the government estimated that the damage caused by the storm could surpass $100 million. St. Lucia said it will be ready to "welcome all visitors in its usual legendary fashion" by November 12. Cruise ship calls to the island, which had been suspended in Tomas' wake, will resume Friday. The popular tourist area of Soufriere was "devastated" by the storm, King said in the statement. "It's not just a question of clearing these roads; sections of the network have completely disappeared. We are just going to have to find another way in and out of the town."